Divya Raman, 35, goes to her friendly, neighbourhood family physician in Koramangala, suburban Bangalore, whenever her family members fall ill. But this is not an average neighbourhood clinic. The walls are a warm magenta and yellow, there is enough space to sit and, most importantly, it is clean. 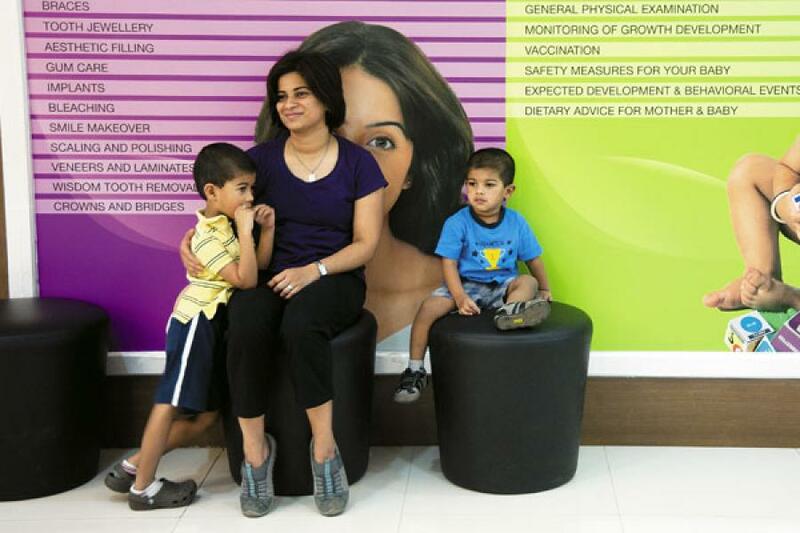 “It is better than regular clinics, as it is clean and you do not get put off by a crowd,” says Raman. Manipal Hospital would be happy to hear Raman’s response. For the last two months, the Rs. 500-crore hospital chain has been trying to perfect a formula to succeed in tier II towns. The hospital’s management decided to shift the business focus of Manipal Cure and Care, its wellness chain, from preventive care, wellness and beauty to playing the role of a family physician. Although 11 of the chain’s 15 hospitals are in tier II towns, it is only recently that it is trying to further carve segments in this market. Fortis and Apollo too are working on targeting different segments in tier II markets. Fortis Healthcare, that has 20 of its 53 hospitals in tier II towns, launched its specialty clinics, Fortis C-DOC (Center for Diabetes, Obesity, and Cholesterol Disorders) targeted at tier II towns in December 2010. Apollo announced in January that they were going to invest Rs. 10,000 crore in building 250 Apollo Reach Hospitals — smaller hospitals than the 51 they have in big cities — in tier II towns such as Karimnagar in Andhra Pradesh. Why are these big hospital chain so interested in small towns? According to consultancy firm KPMG, data from 2009 shows that India has 0.7 beds for every 1,000 people, the lowest among BRIC nations. To increase this bed capacity by one for every 1,000 people in tier II cities, at least 500,000 beds are required, says Technopak, a management consultant firm. India needs between 3,333 and 7,142 hospitals in tier II cities alone. The three largest hospital chains — Manipal, Apollo and Fortis — have about 33 hospitals in tier II towns such as Kangra, Raigad, Moradabad, Salem and Visakhapatnam. Of the $33 billion that Indians spend on healthcare, just 20 percent is spent in smaller towns. “For major surgeries and treatment of serious ailments, patients still travel from small towns to one of the seven large cities — Delhi, Mumbai, Chennai, Hyderabad, Bangalore, Kolkata and Ahmedabad,” says Dr. Rana Mehta, senior vice president, healthcare, Technopak. As the health industry gets more competitive in metros, large chains are doing their variation on the ‘bottom of the pyramid’ because of the profit margins that small towns can offer. “For example, you can buy land for Rs. 3 crore in a tier II town. The same land would cost three times more (Rs. 10 crore to Rs. 12 crore) in a tier I city. This has an impact on both the break-even stage of a hospital as well as profit margins,” says Mushahid Ali Khan, analyst, Technopak. He says it is about getting the right mix of investment and maximum usage of equipment. For example, a hospital may get a less expensive ultrasound machine — for Rs. 30 lakh and not Rs. 50 lakh. This will not compromise on quality, but will boost profit margins. Naik says a Vaatsalya Healthcare hospital breaks even between one and three years now. This is a year or two less that what it would take for a hospital to break even in a tier I city. Sources in the industry, who do not wish to be named, say a hospital in a tier I city can have a margin of 6 percent, whereas one in a tier II city can have margins of 12 to 15 percent. Depending on the mix of services and medical equipment, this can go up to as high as 19 to 20 percent. Traditionally, patients in tier II towns go to neighbourhood physicians and, depending on their health problems, move to clinics and hospitals recommended by the doctor. This practice shall continue, except that patients will not have to go to a big city for treatment at a hospital. These hospital chains are picking from among three segments of health care to position their services. The primary segment is the family physician in which Apollo (through Apollo Clinics) and Manipal (through Cure and Care) are present. The secondary segment comprises one or multiple areas of specialty, such as Fortis’ C-DOC, which focusses on diabetes, cholesterol and obesity. The Apollo Group plans to have Apollo Reach Hospitals in this segment. “Apollo Reach Hospitals will be a significant growth driver for the Apollo Group over the next few years given that there are more than 30 towns in India that offer opportunities for setting up specialty hospitals,” says Dr. Prathap C. Reddy, chairman, Apollo hospitals. Although large chains have the financial muscle for trial and error, the opportunity in the tier II and tier III markets has spurred new entrants with a different approach. Chains like Vaatsalya Healthcare are building smaller hospitals with a focus on local needs. Apollo is a step ahead of the other two because they not only have tertiary and secondary healthcare services, but also a primary service in Apollo Clinics. “The group plans to set up Apollo Clinics at all locations having Apollo Hospitals and Apollo Reach Hospitals,” says Sudhir Diggikar, CEO, Apollo Health and Lifestyle Limited. But smaller towns will be challenging environments. Infrastructure, the demand-supply gap in health care, geographical accessibility are some challenges before the sector. However, low real estate rates and lower staff salaries can result in “at least a 20 percent lower cost to set up the hospital, not including land prices,” says Satish Menon, analyst, KPMG. “The lack of manpower is a limiting problem in tier II and tier III cities. We will look at tie-ups with additional diagnostics as a way to address this,” says Dr. Pervez Ahmed, CEO and MD, Max Healthcare. For the big players, the problem is not so much as sourcing talent but utilising it. “In every state with a large Apollo hospital, doctors will service Apollo Reach hospitals as well,” says Dr. Preetha Reddy, MD, Apollo Hospitals. 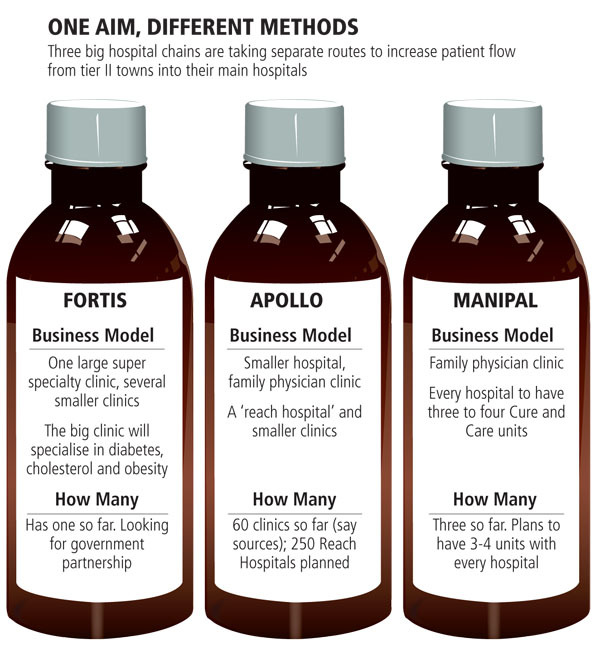 “For example, doctors from the two Apollo hospitals in Chennai take care of 20 [Apollo] Reach hospitals.” Manipal and Fortis will also engage their senior consultants in tier II and tier III cities when required.